THE CANNIBAL OF Wanni has preyed on another busload of men, women and children. Over fifteen people were killed and many more injured in a claymore mine attack the LTTE mounted on a civilian bus in Kebithigollewa on Wednesday. That cowardly act of naked terrorism came close on the heels of a parcel bomb that killed about twenty people at Nugegoda last week. Prabhakaran blinded by a frenzy of rage has fought his way into a trap of his own making, spurning every opportunity to resolve the conflict peacefully. Piqued, beleaguered and desperate, he is capable of any crime. He seems determined to plunge the country into a bloodbath once again, seeking foreign intervention. 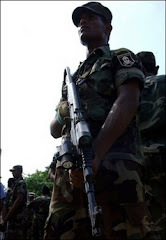 For, the Tiger chief is aware that the military onslaught on the horizon is too serious a threat to be overcome by occasional raids like the recent one at Anuradhapura. And the Wanni would be too small an area for him to hide in, should the army move in. Sri Lanka’s Ozymandias of terror, has, after twenty five years of fighting, had to begin from the very beginning, taking as he does civilian targets. It is like a failed graduate going back to the kindergarten to start education all over again with a view to succeeding in life! Prabhakaran is a failed CEO who has wasted billions of dollars and driven tens of thousands of youth to suicide. He has got nowhere near his goal. Only he and his family seem to have have gained from this war. He is putting on weight like a parliamentarian. His son is being groomed for leadership. If Prabhakaran thinks he can break the will of the people to resist terror by targeting them, he is sadly mistaken. He has failed in that endeavour in the past and he is sure to fail in the future as well. With each attack on civilians, he only gives the LTTE’s journey down the Gaderene slope a fresh impetus. He has made himself an embarrassment even to his close allies. The LTTE’s systematic elimination of civilians in tens, twenties, fifties and hundreds has all the trappings of a low intensity genocide. Luckily, in 1983, the pogrom against Tamils didn’t develop into genocide as the vast majority of the people refused to combine forces with the government-sponsored death squads. But, the genocidal megalomaniac who used that pogrom as a springboard to a savage terror campaign is at large in the North relishing an ethnic bloodbath. He must be stopped in his tracks. It is high time his friends, both local and foreign, prevailed on him to eschew violence and come for talks. That is the only way to prevent him from destroying many more lives in vain. It is not only Prabhakaran who should be held responsible for the premeditated attacks on civilians. All those who are supporting him either overtly or covertly have the blood of the innocent people on their hands.